With The Mummy movie, one of the biggest cinema hits of 2017, many casino gamers (re)discovered Playtech's Desert Treasure slot games. 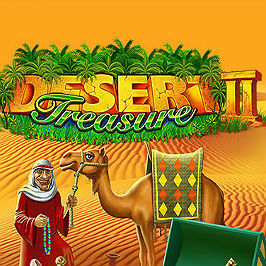 Following the success of the original slot, Playtech's Desert Treasure 2 is just as much of an exotic adventure. In fact, when it comes to mystical features and payout potential, this follow-up game unlocks even more of Egypt's secret stash buried beneath the pyramids and deep below the golden sands of the desert. The slot contains the same 20 paylines over five reels and almost identical symbols and style, but has an upgraded oasis bonus game, different paying combos and the allure of lucrative expanding wilds. Play Desert Treasure 2 for Real Money! Desert Treasure 2 slot is the follow-up to the much-loved Desert Treasure from software giant Playtech – once again set against the backdrop of Egypt's golden desert and pyramids. Visually, the game is very similar to the original, with familiar symbols including Cobra Wilds, Egyptian princess scatters, desert oasis bonuses, camels, treasure sheiks, scorpions, scarab beetles, spiders, lizards and snakes. The humble turtle has made its way into the game – possibly because it didn't get there in time for version one. The main upgrade in Desert Treasure II is the new-found power of the Cobra Wild to expand across the reels – a very popular feature due to the potential for big wins if you happen to get lucky. 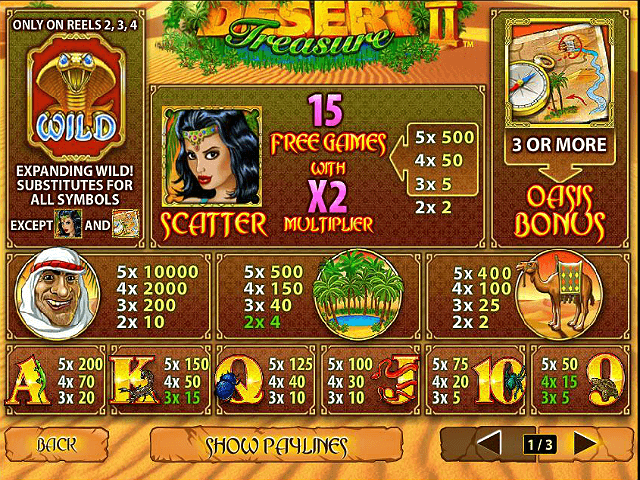 There's also a second screen and more chances to win in the desert oasis bonus game, which features the same treasure selecting interactivity as originally seen in the first slot. 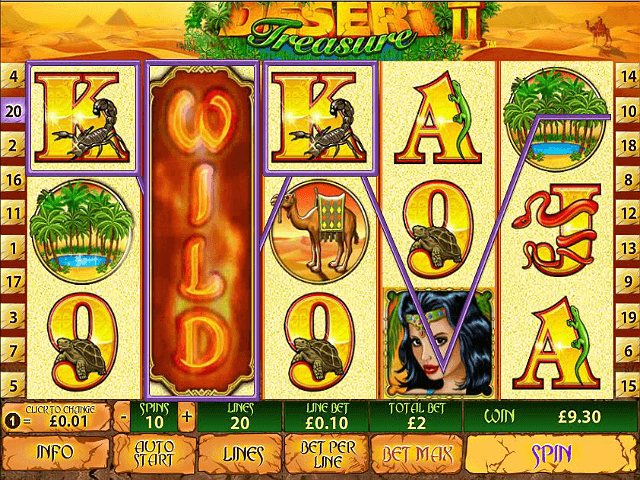 Desert Treasure 2 video slot can be played with coin ranges from 0.01 to 5.00, with a maximum of 100 coins per spin. The game fundamentally features the same symbols found in the first edition, but the value of some of the icons have changed, especially the treasure sheik whose desert reputation has clearly taken off. Turtle, lizard, scarab, snake and spider icons pay from 5x to 200x. In Desert Treasure 2, the princess retains her mystical reputation, but showers you with an extra five free spins when you find her scattering over three or more reels. Payouts have a 2x multiplier attached to them, compared to 3x in the previous version. You can still re-trigger extra free spins during the game. As in the first Desert Treasure slot, matching three or more desert oasis symbols carries you away into the realms of the sheik's treasure, where your task is to pick from his range of chests, vases and interesting objects. This time around, you can also stumble upon the map, which contains directions to the secret tent or hidden sanctum, where more cash rewards await, so it pays choose your destination wisely. If there is one striking difference between the original Desert Treasure slot and version two, it's the expanding Wild Cobra feature. When the icon lands on reels two, three or four, it flares its venomous tongue over the whole reel, which is the key to some handy payouts – and potentially a biting jackpot if you manage to get the snake on three reels at the same time. 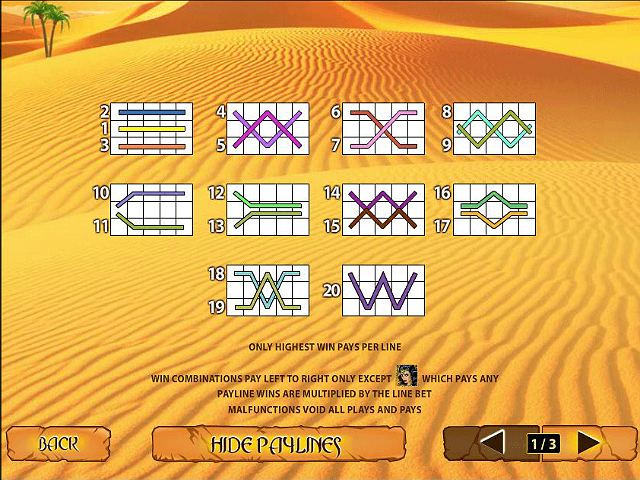 Playtech's Desert Treasure II slot looks and plays virtually the same as the original. But if you like more interactivity on bonus games and particular expanding wilds, you may fall for the desert's charms once again. Share this Desert Treasure 2 Review today! 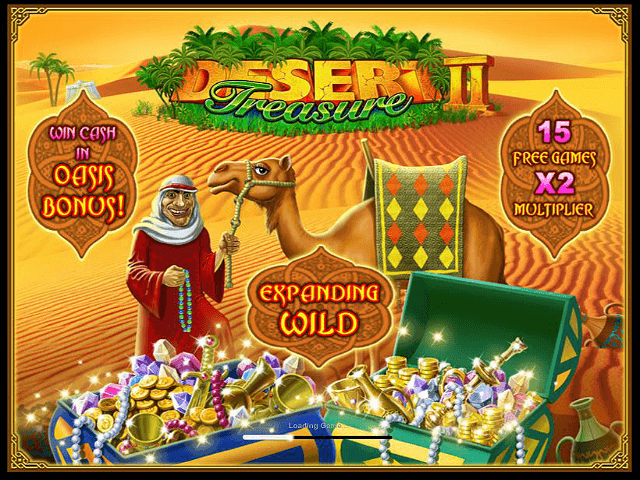 If you like Desert Treasure 2, you'll love these slot titles too!